Get all the facts and figures that link positive behavior and school culture to a wide array of real benefits and results for districts and schools of all shapes and sizes - all in an easy-to-digest research brief. 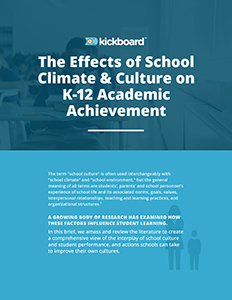 In this research brief, we'll walk you through the important statistics and give you insightful actions that you can immediately take to improve school culture. Download this fact-packed research brief delivering a comprehensive summary of over 14 major, cited studies.